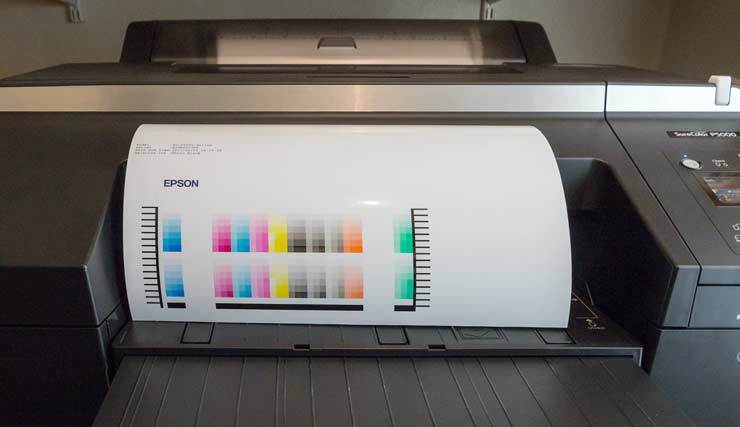 Keith Cooper is currently testing the Epson SureColor P5000 printer for one of his in-depth reviews. 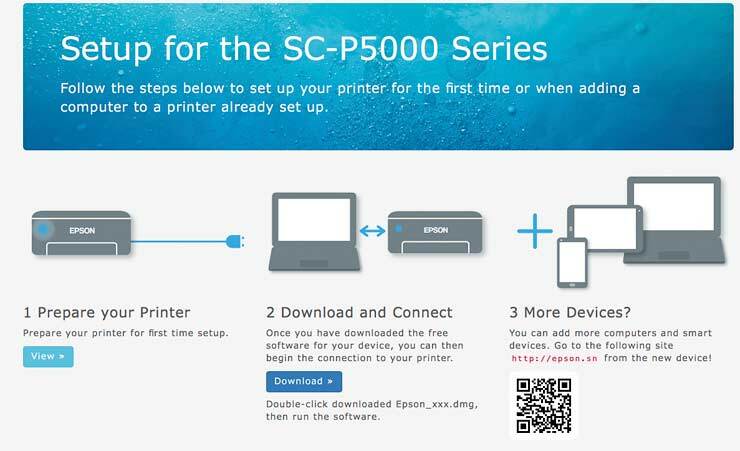 As part of this we received a brand new P5000 from Epson UK – This initial article cover all the initial setup activity and configuration you’ll need to get the printer up and running. 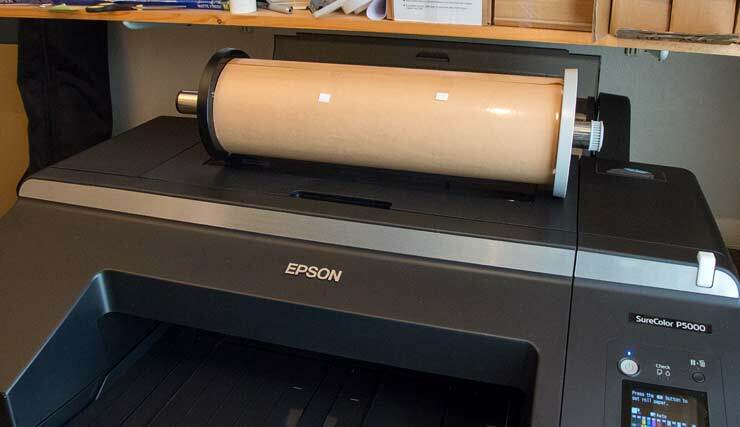 The Epson P5000 at 17″ width may be quite a lot smaller than the 24″ Epson P7000 I reviewed last year, but it still comes in a much bigger box than the excellent 17″ Epson P800. 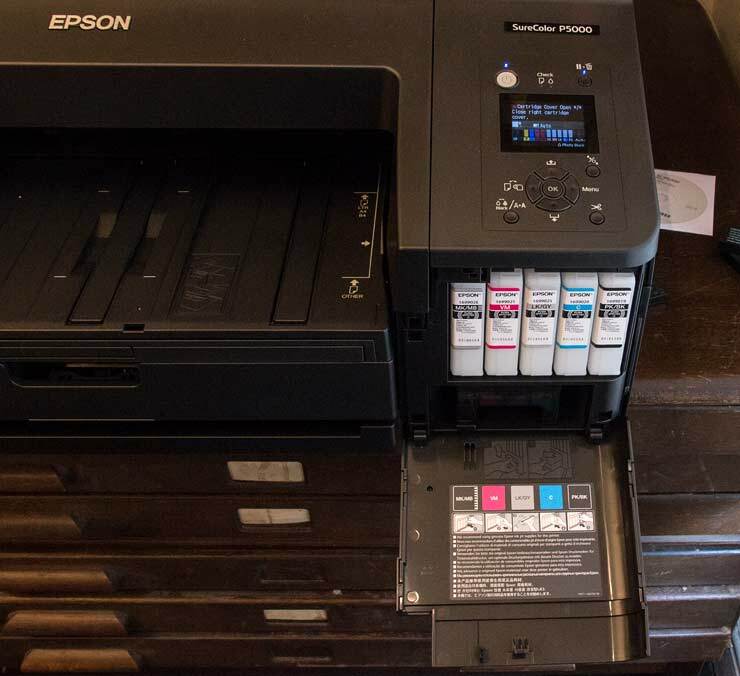 This article covers its installation and initial configuration, right up to the point I can start using it for making prints. It’s shipped on a pallet and arrived in a big truck. 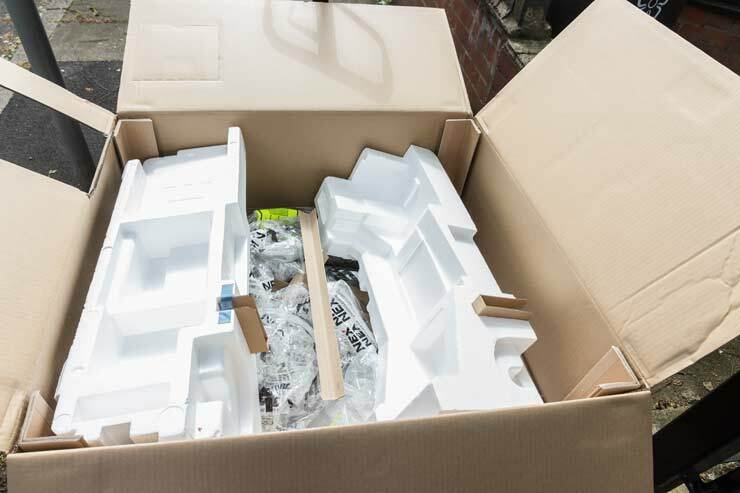 The delivery driver was very helpful, realising that the box and pallet were simply not going in through my front door. The box on top is a spare set of inks. 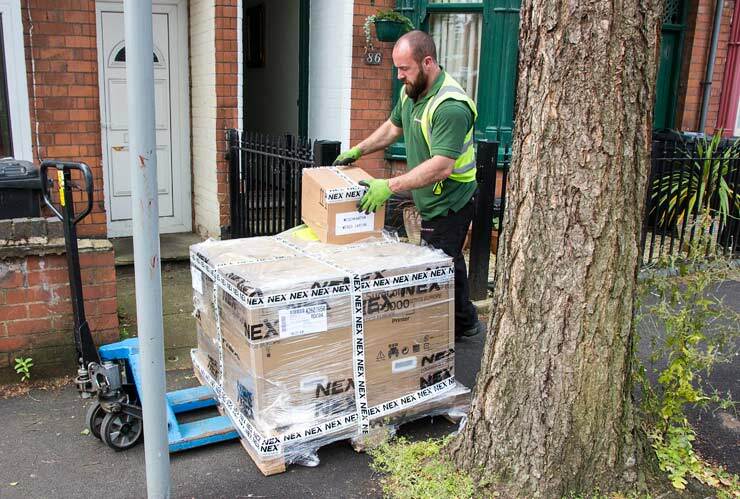 The printer definitely needs two moderately strong people to lift it out of the box, and in my case carry it into the house. If you are getting a P5000, note that it wasn’t raining and that not all delivery people will be that helpful. 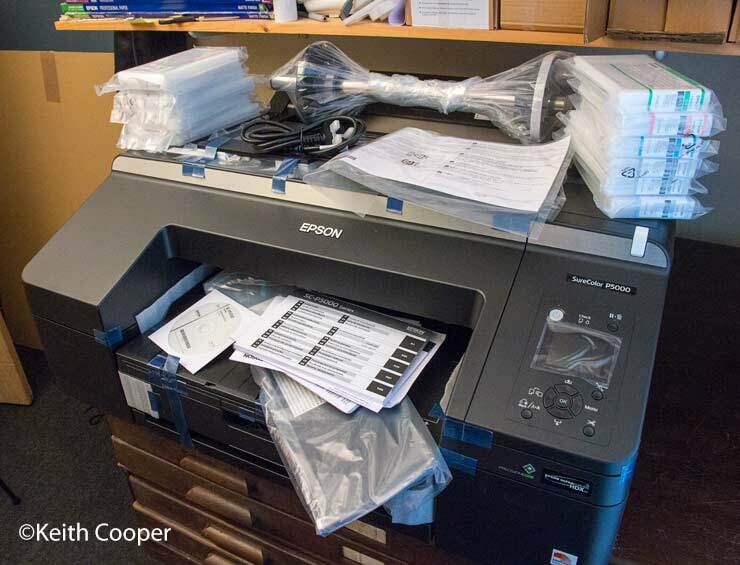 The printer is being tested in my print room – recently vacated by my old Canon iPF8300 44″ printer. I’ve moved the plan chest over, for the P5000 to stand on. Here it is with the contents of the box. 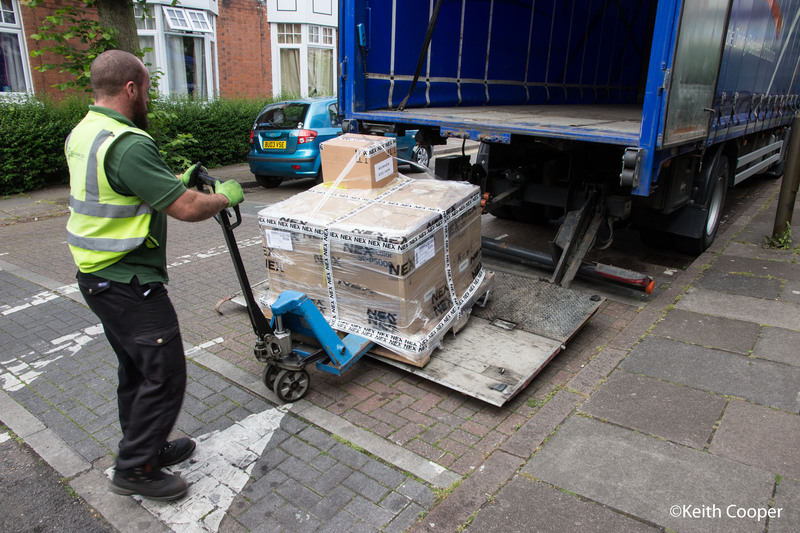 The printer is at the front of the chest, since you need space at the back to print manually loaded sheets, particularly if you’ve stiff media to uses (I’ve a box of poster-board I’ll be trying). 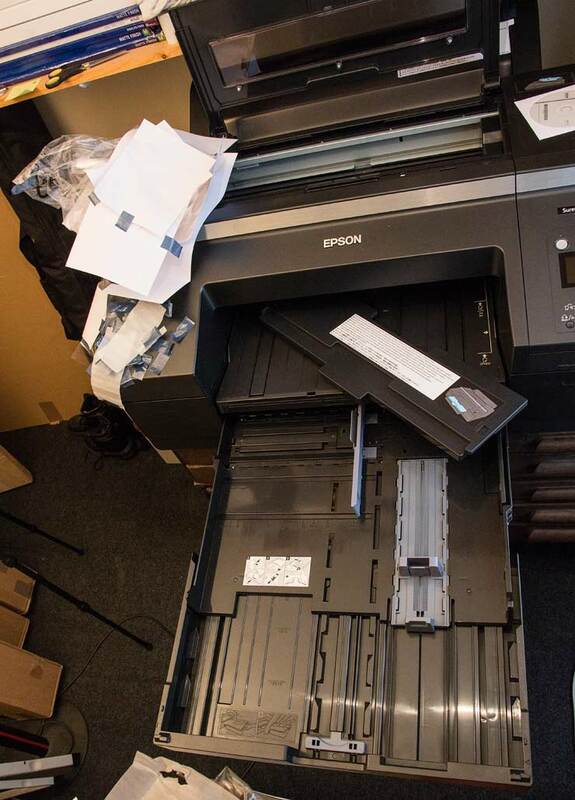 I’d query this for larger stiff media – you’ll see from the photo that I’ve the printer right at the front edge of the chest. 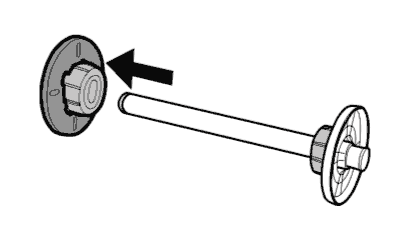 However, the basic setup sheet (top) is very clear in a step by step guide to what you need to do. This initial setup stage is also covered in the online install process, but the paper sheets are clearer for me. First up I need to remove a lot of tape tabs that are there for shipping. There are ones round the back and inside too. 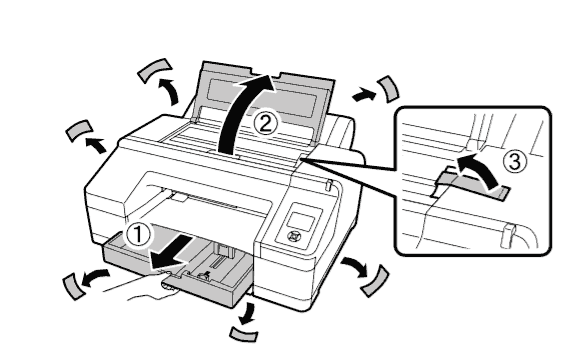 The guides are very clear, and once I’ve removed all that tape, I check the parts needed for setting up the printer. A few more parts need putting in place. The roll holder end just slides in place – there are adapters for borderless printing and 2″/3″ core sizes, but I’ll look at that in the actual review when covering paper handling. At the moment I just lift the roll cover and drop it into the slot inside. 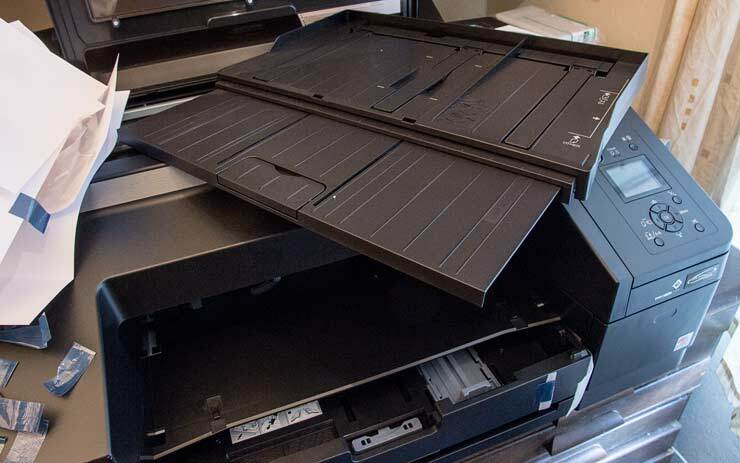 The printer has a paper tray that accepts up to A2 size paper. It extends out forward, to take large sheet sizes. If you have it set this way, there is a gap at the front where dust could get in – this is what that spare plastic thing you’d noticed is for. It clips over the front of the tray when extended for large paper. One other detachable item I’d note is the paper output and front manual feed tray. 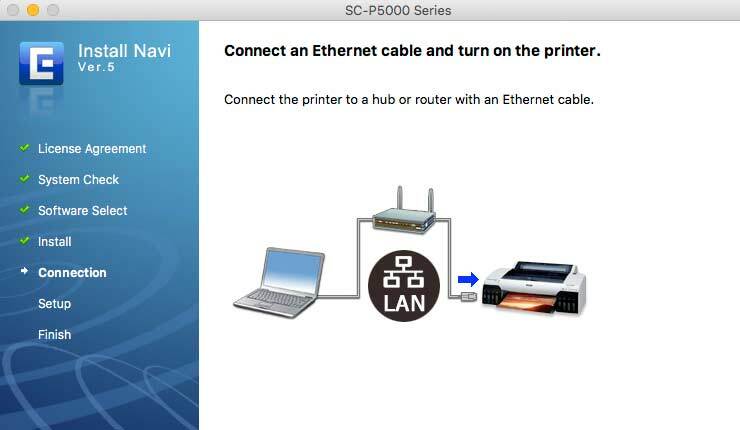 The printer has USB2 and GigaBit EtherNet connections (cables not supplied), so I can easily set up the printer with a USB connection to my laptop, or just connect it to our EtherNet. 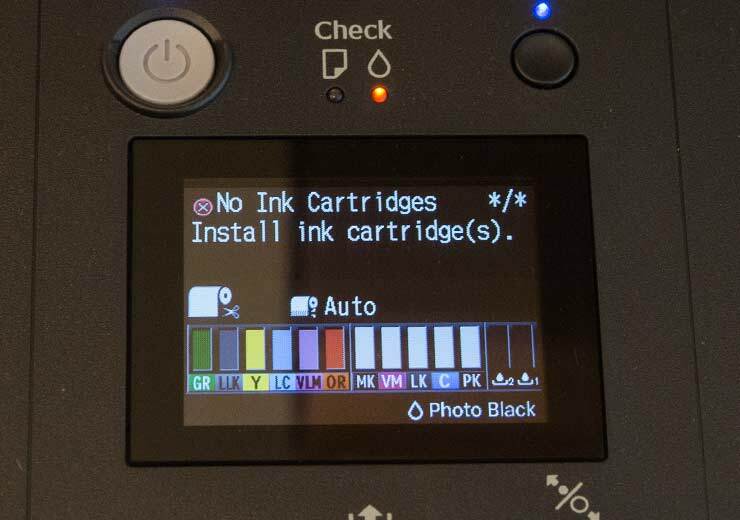 Before I worry about connectivity, I need to install the 11 starter (80ml) ink cartridges. 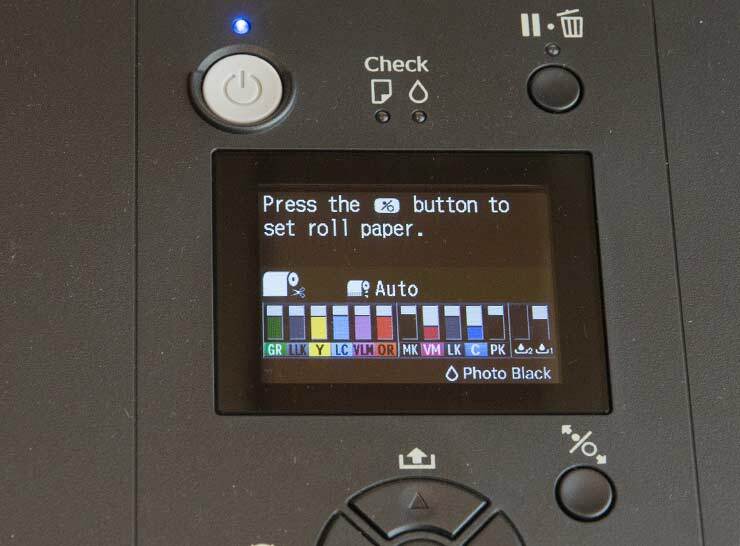 Ten are active at any one time, with a switchover between Matt Black and Photo Black enabled for different paper types. 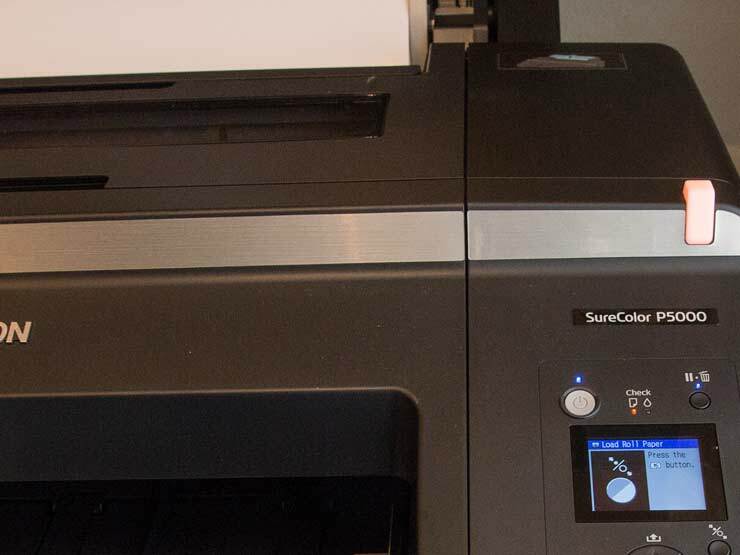 When you buy a P5000, you need to choose whether to have the version with a light-light black ink for smoother tonality in light areas and B&W printing -or- the violet ink, which gives a slightly larger gamut. 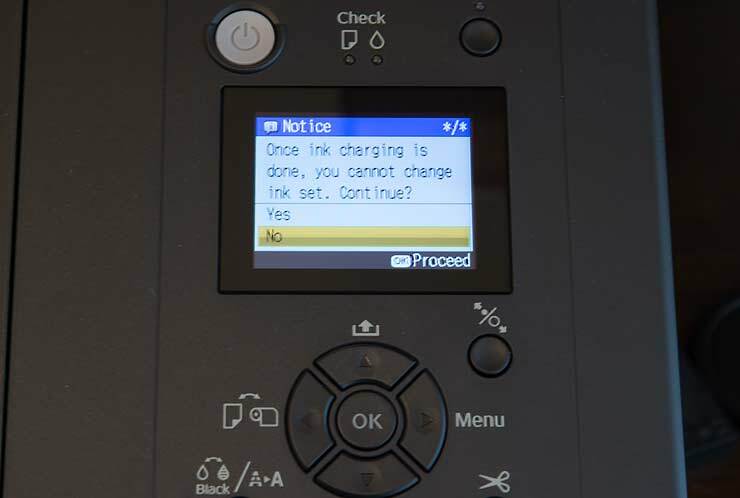 The very first thing I have to do when starting up the printer is tell it which option I’m using. 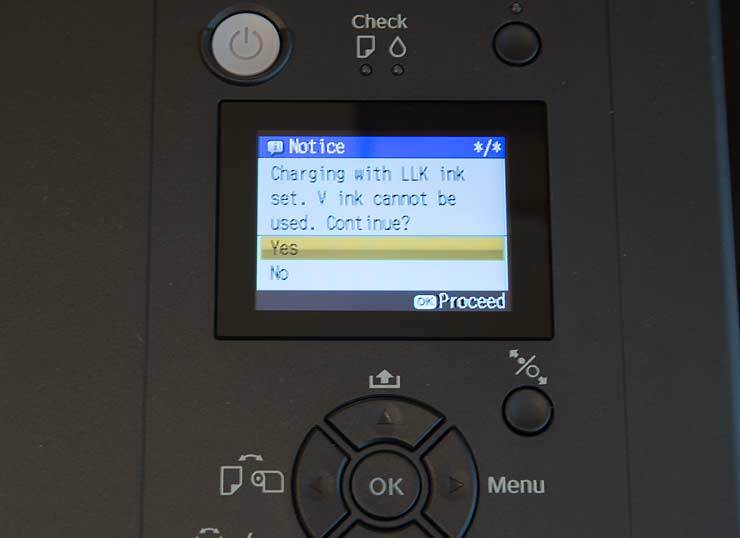 The printer wants to make sure. Am I really really sure? OK, that’s it and it’s time to load the carts. I’ll start on the left. 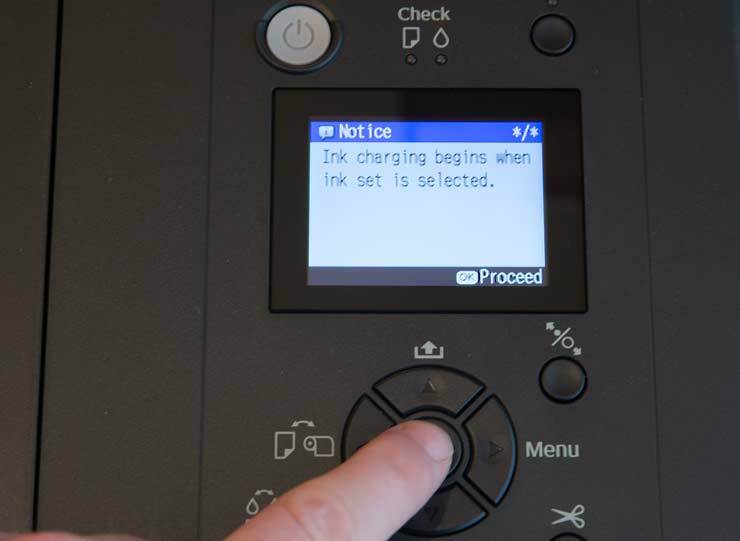 The ink cover just flips out with a (very) light press, the carts click into place. Now for the right side. 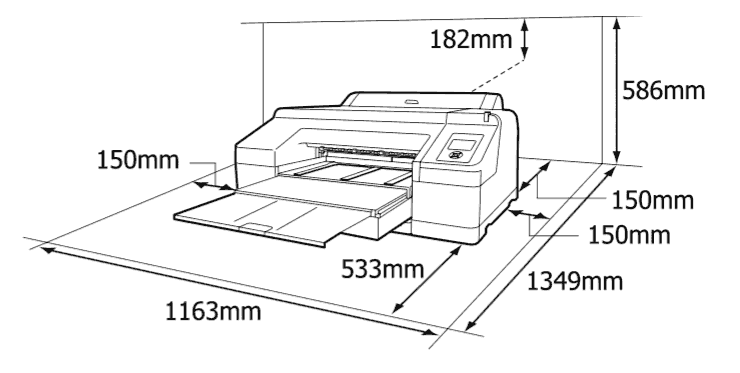 Closing the cover starts a period of 10-15 minute whirring noises as the inks are pumped through to the print head. After a while, the process is finished and I can load some paper. 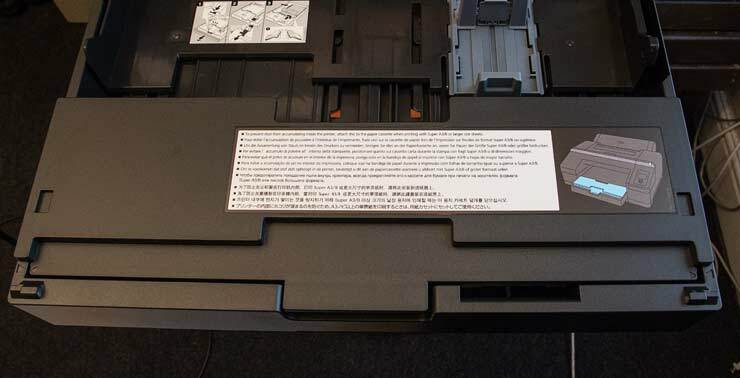 If you look at the picture above, you can see how some ink has been used from each cart, in filling up the ink lines and the print head. Some of this has also gone into the main maintenance tank (#1 – far right). 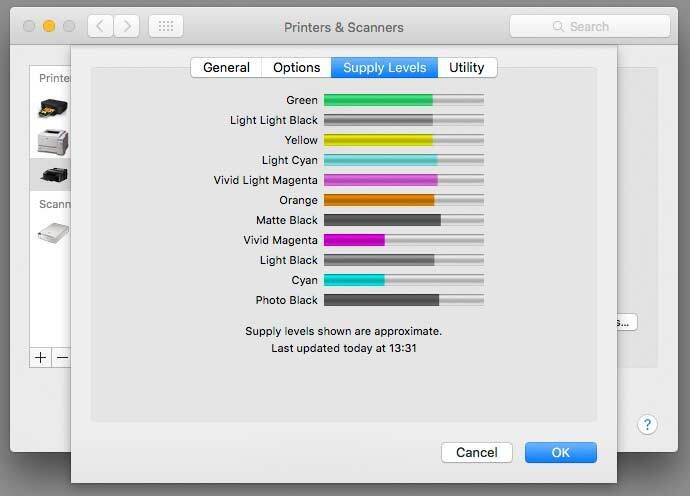 This is quite normal when you set up any printer. However, note that the VM/C levels are a bit lower – what happened? Well, whilst I was watching the printer (at about ~70% into the ink charging) I leaned over it to look inside. I brushed against the door to the left cartridge slots. The door popped open and the ink charge process stopped. I closed the door and it restarted with the progress bar at 0% – it zipped through quite quickly, but two carts seem to have gone down quite a bit. Now I can’t repeat this and I don’t suggest you try it, but I’ll just say that you should be careful with the front covers for the ink carts. Incidentally this also happened whilst printing out a paper profiling sheet. 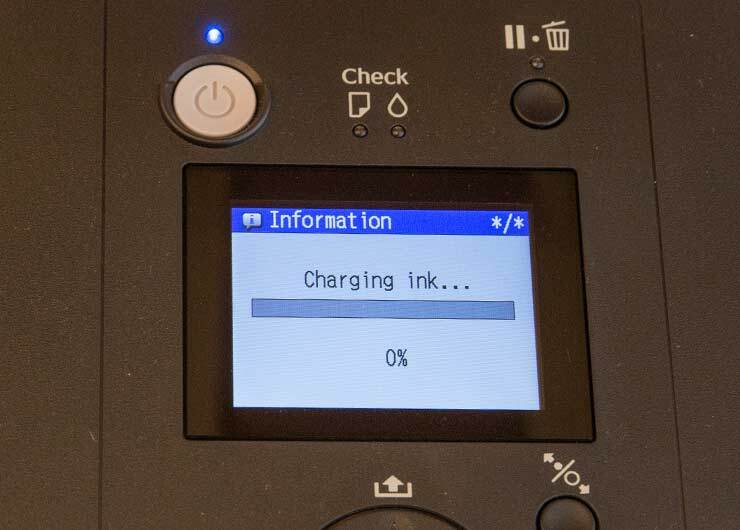 The printing paused and when it restarted, about a centimetre of printing was faulty (i.e. the whole sheet). 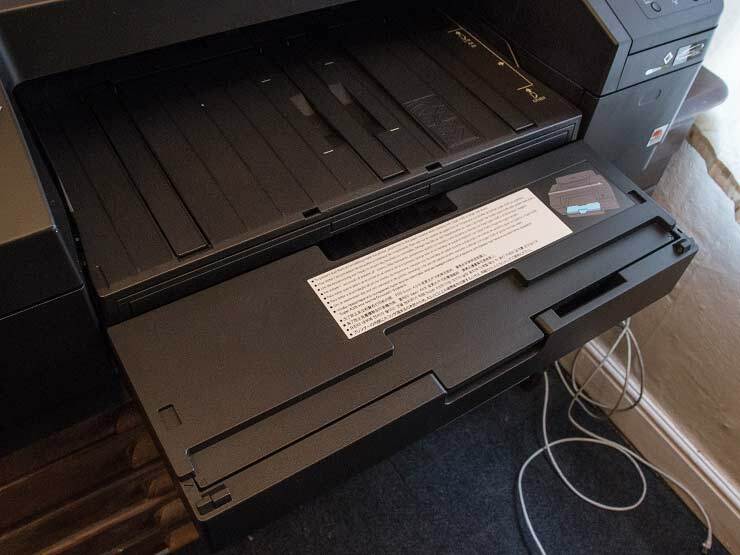 Perhaps this is why there is that suggested space in front of the printer – anyway, I have two bits of the shipping tape re-purposed to avoid me opening the panels by mistake. 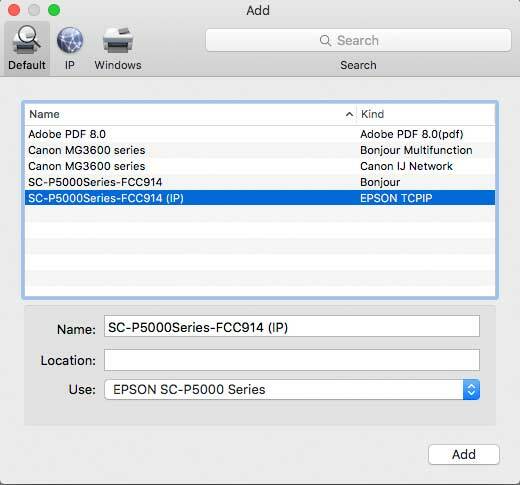 Although the printer comes with a CD, on my Mac all you get is a link to a web site to download the software needed. This isn’t actually so much of a problem these days (you get the latest drivers for example), but worth noting if you are setting up a printer in an environment where external downloads may be limited. 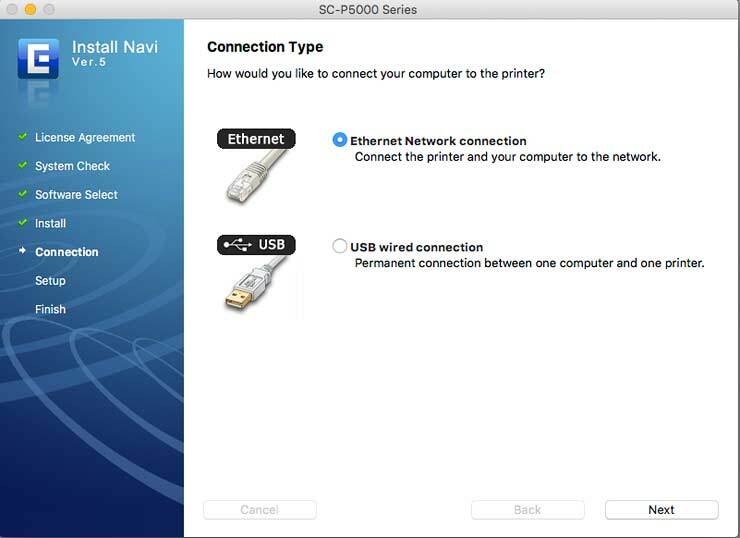 It’s quite easy to follow the menu options on the printer to set up an IPv4 address and other networking settings directly from the front panel – although you do need to understand some networking basics and know what addresses to use. 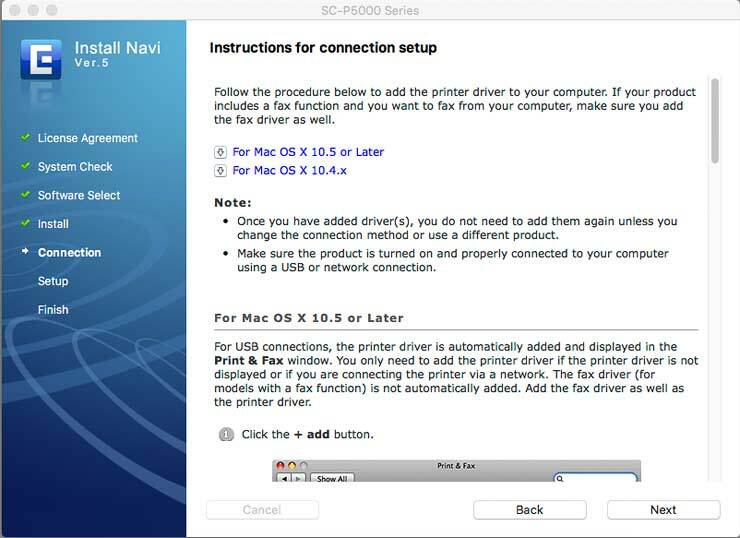 In a simple networking environment, the printer and software can find each other over the network and set things up from your computer, however depending on the complexity and security installed this may not always work. 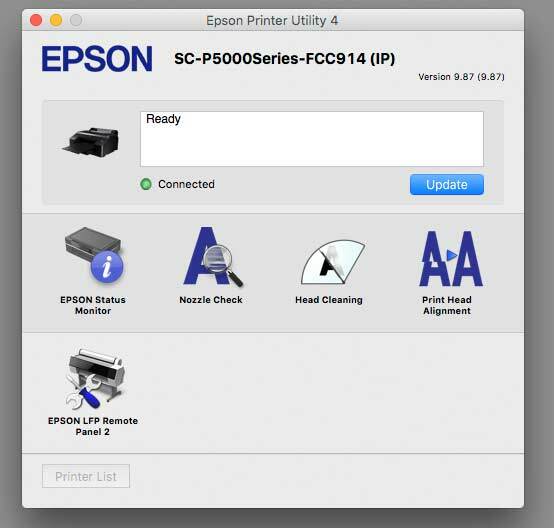 The easiest way may be to temporarily connect your new printer via a USB lead as well as the EtherNet – I connected it to my MacBook Pro via both. 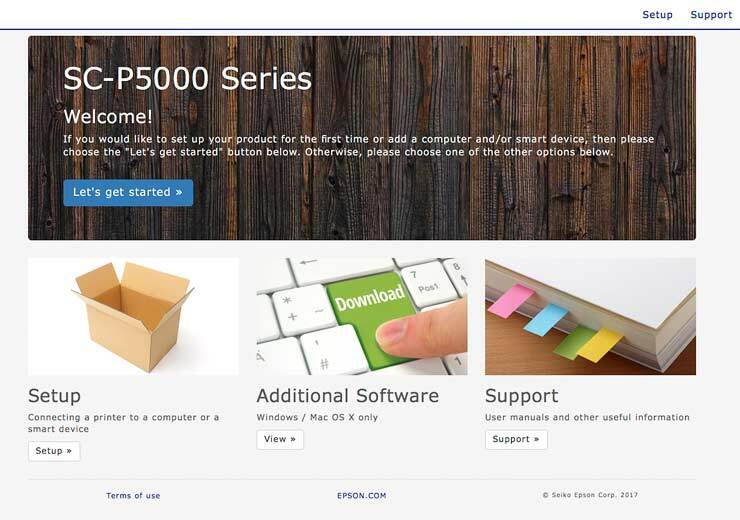 To get the software, just enter your model number on the setup web page. 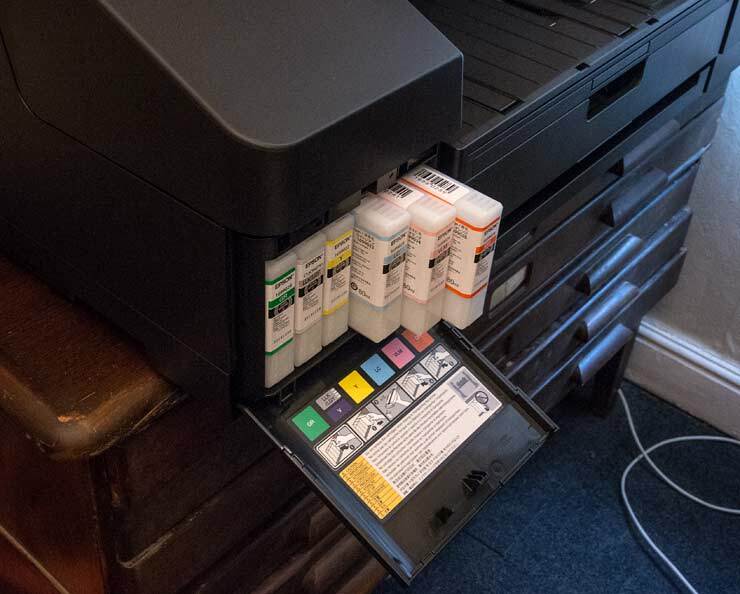 I’ll start with the basic setup – I’ll be looking at some of the additional software in the review, although I cover Colour Calibration later in this article, since like Print Head Adjustment, I regard it as essential elements of setting up the printer. As I said, it’s stepwise process, that’s clearly explained. 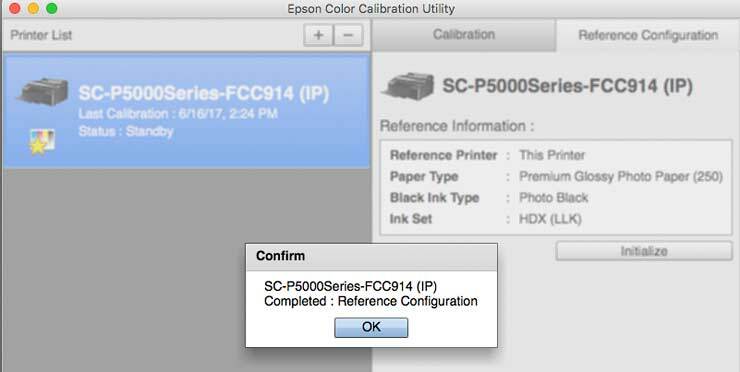 I’ve loaded the inks, so need to download the setup software. The screen shots of the setup software are all using Macs here, but the process is very similar for Windows. 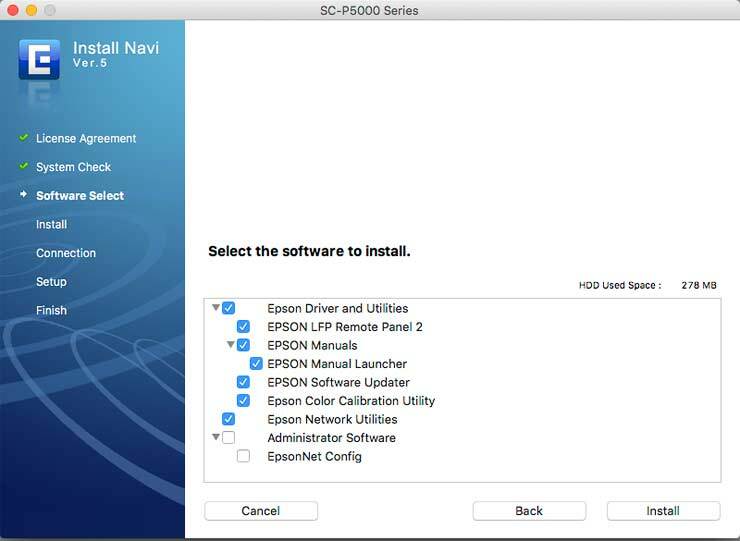 I select software to install – I’d pick all of it. 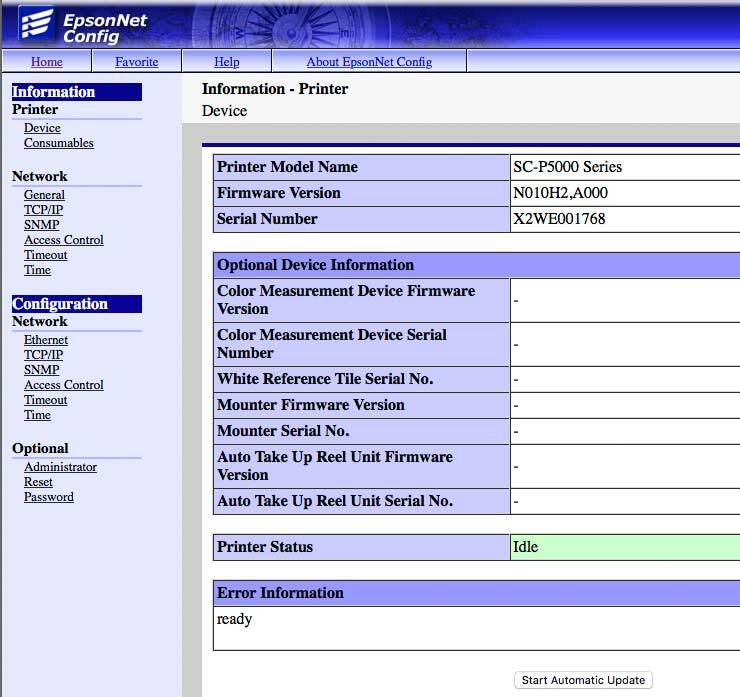 The software needs to know how I’ve connected the printer. 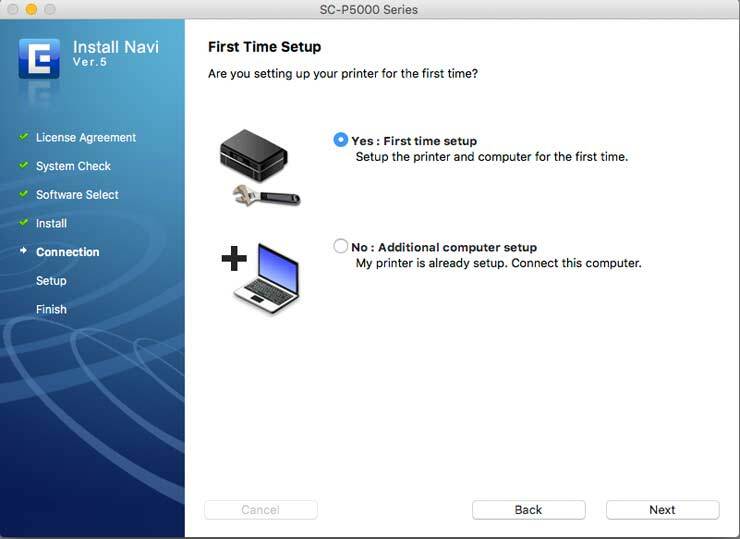 The software works whether this is the initial setup or just adding it to your computer for an existing computer. The software has plenty of reminders built in. 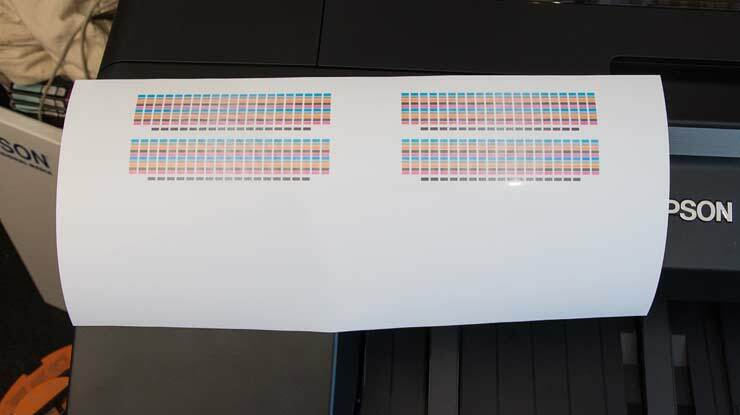 I’ve picked the network connected printer. 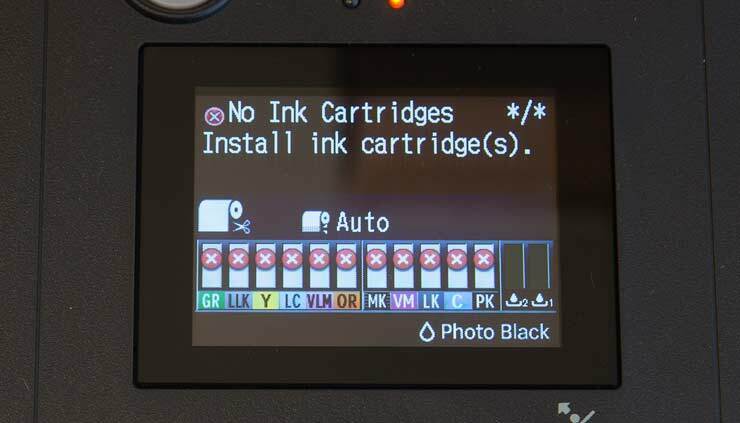 or check the ink levels. 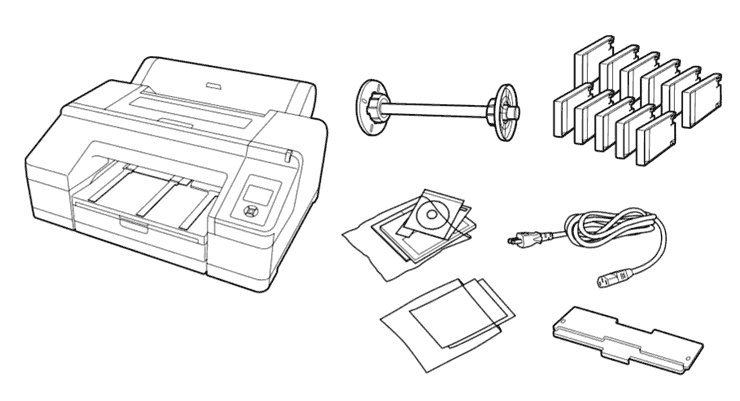 Well, that’s it, the printer is ready to go. 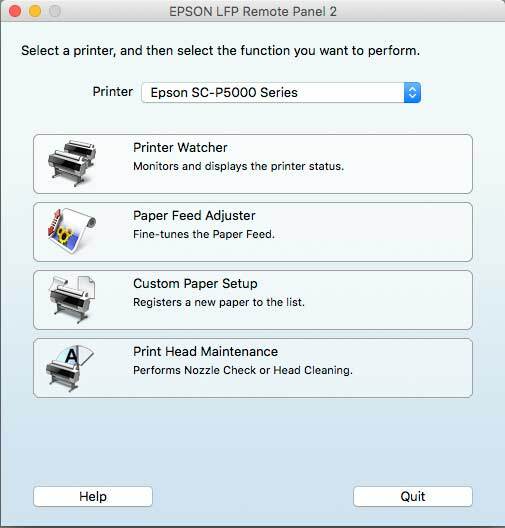 Before starting my use of the printer I want to adjust two features that will help produce better quality and more accurate prints. 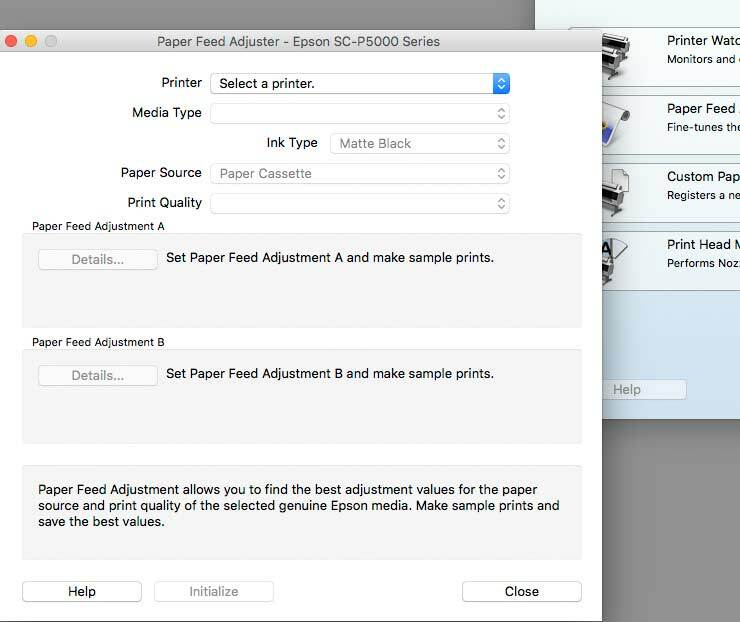 The first is to check the paper feed adjustment – this calibrates paper movement at a fine scale to reduce any chance of banding. 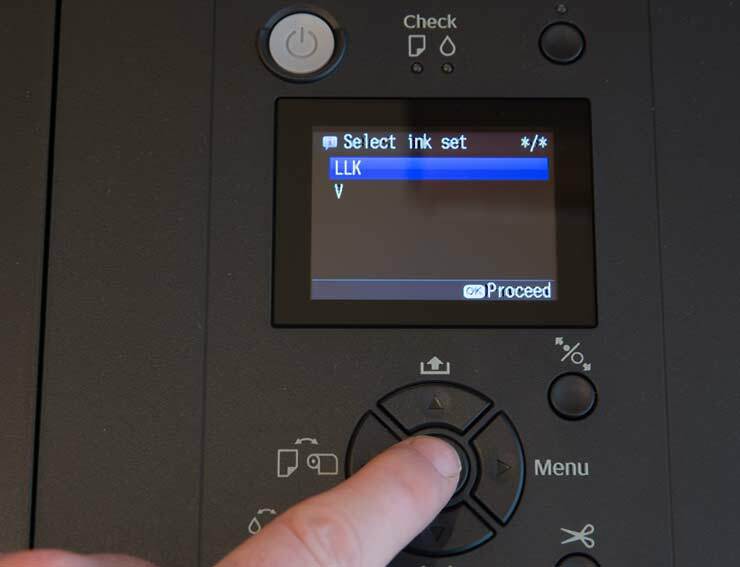 and then the remote control panel (you can also do this adjustment directly via the printer control panel). 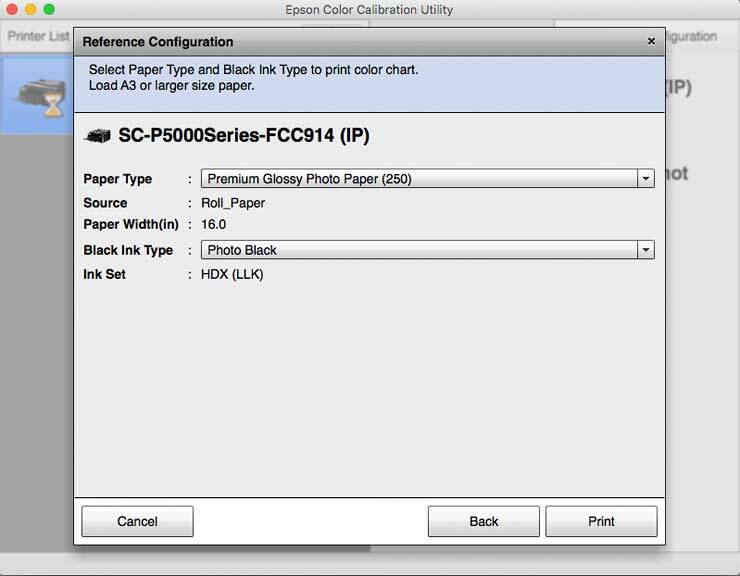 I’ll load up a 16″ roll of Epson PGPP250 glossy paper. There is a ‘how to load paper’ option on the main menu, but it just goes into the slot and gets loaded after you press the release button. Just follow the instructions for Adjustment A and a test pattern will be produced for the built-in sensors on the print head carriage to measure. 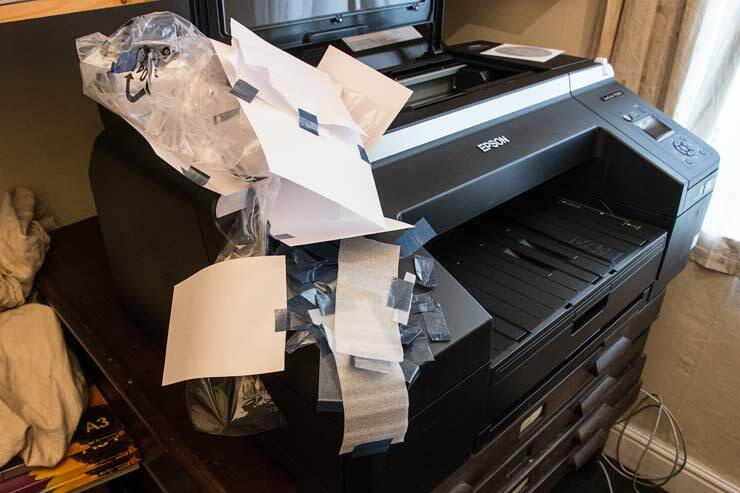 I went off for a cup of tea, and by the time I came back upstairs with it, the printer had finished its measurements on this print. Just the ‘A’ setting is OK at this point. 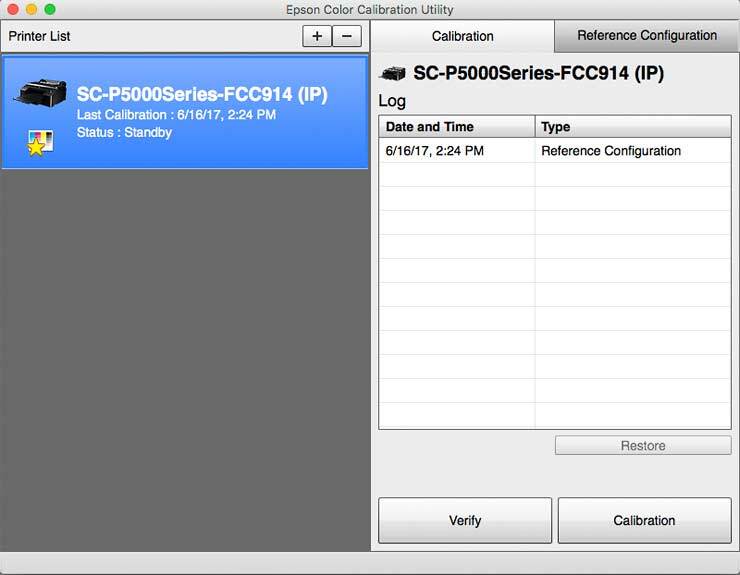 The calibration utility software allows you to get your printer to a known state – having done this, I know for example that the ICC profiles I make will be more accurate for other people’s P5000 printers. It’s also a confidence test that the printer is working OK for my subsequent testing. 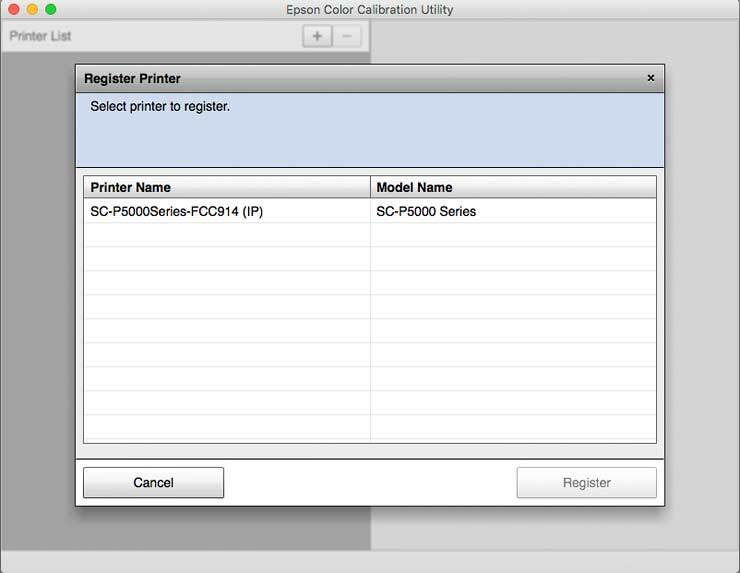 The calibration is of perhaps more immediate use for people with multiple printers wanting to synchronise their print performance across multiple printers. It’s very simple to do with the glossy paper I already have loaded. 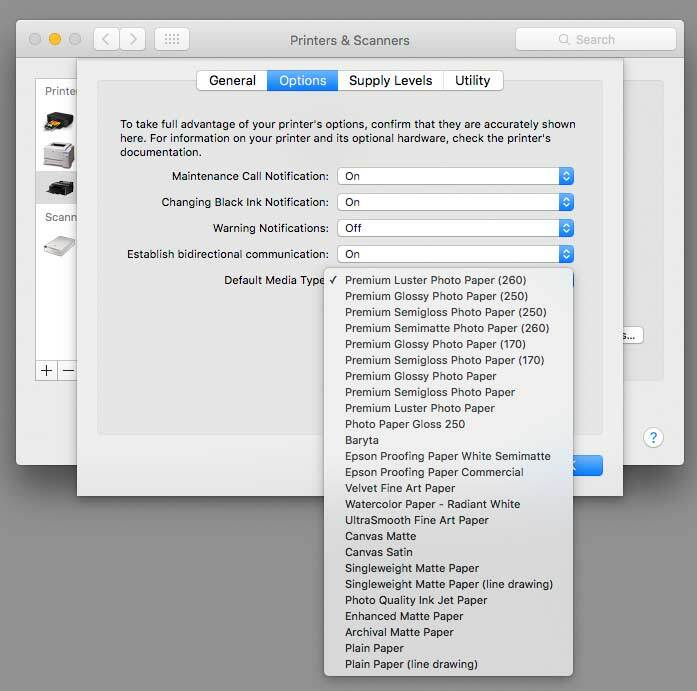 You need to select the printer. After a while, the measurements are completed. 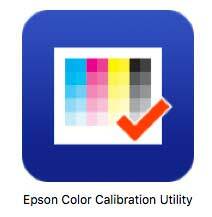 I now have a completed calibration sheet.